Introducing the stronger security for your FPT HI GIO CLOUD Account. With multi-factor authentication, you’ll protect your account with both your password and your phone. 01. Whenever you log in to FPT HI GIO CLOUD, you'll enter your password as usual. 01. Then, you'll be asked for OTP. A verification code will be sent to your trusted phone number via SMS. Your account will be permanently secured, because if someone else would try to log in to your account from any device or would hack your password, the multi-factor authentication will be required. Each verification code can only be used once and is valid only during 2 minutes since it’s been sent to your trusted phone number. You can request a one-time use backup code for such situations as when your phone is unavailable, or lost, or you’re travelling. Technical support about multi-factor authentication is available 24/7/365 for all FPT HI GIO CLOUD customers. HOW TO ACTIVATE/DEACTIVATE MULTI-FACTOR AUTHENTICATION: View the User Guide, Click here. 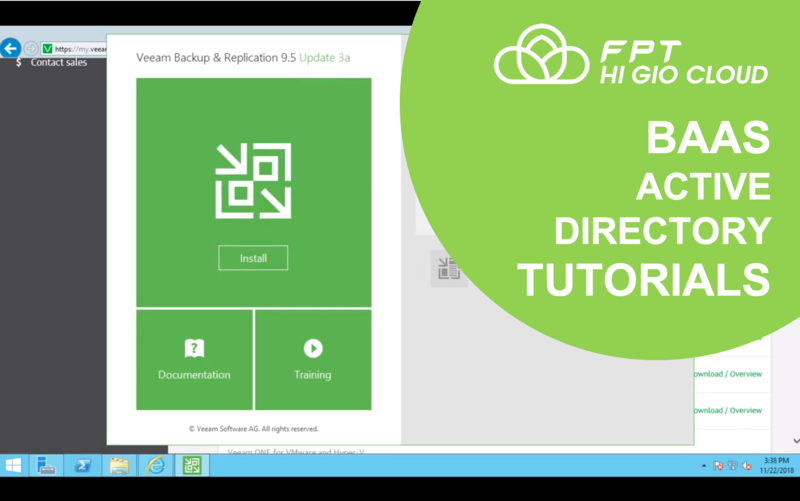 Backup and restore your data and system in the FPT Data Centers through the FPT HI GIO CLOUD platform. 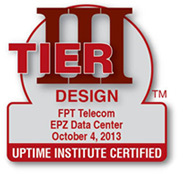 FPT HI GIO CLOUD BaaS guarantees you robust protection and fast recovery. Set up your own backup Schedule. Implement multiple backup operations at one time. Save your storage space with the incremental backup. Your data transfer and storage are encrypted. Large domestic (Vietnam) Internet bandwidth for the fast and efficient backup and recovery. Your system is continuously operating without a downtime. 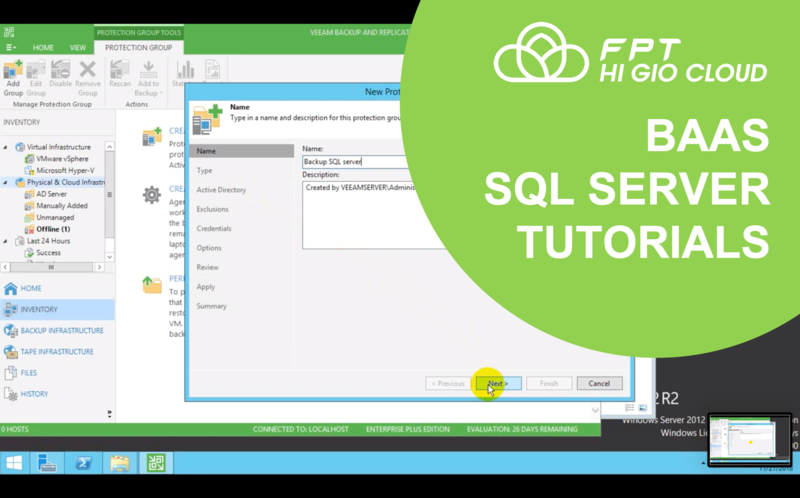 Replicate a part or an entire physical or virtual server to FPT HI GIO CLOUD and ensure the high level of data redundancy and fast recovery. Supports both: physical and virtual servers (VMware/Hyper V). main system anytime on demand. Schedule and automatize your system synchronization. Automatically check the integrity of data backup. Technical support about all new functions is available 24/7/365 for all FPT HI GIO CLOUD customers. 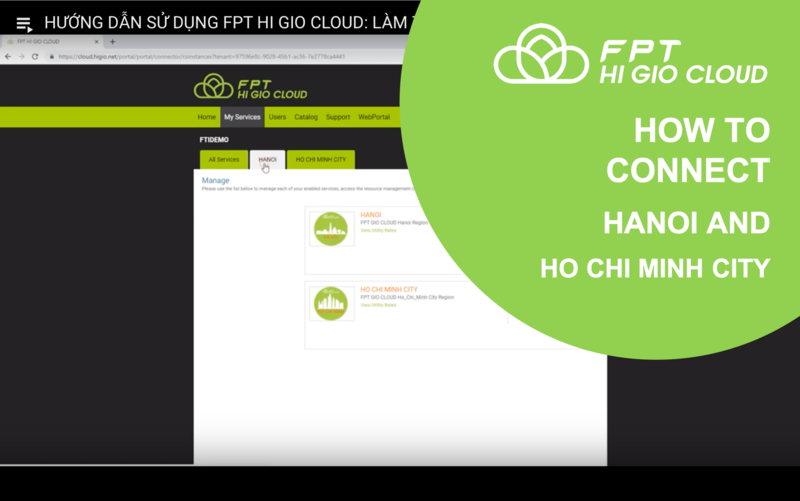 FPT HI GIO CLOUD operates in multiple datacenters around Vietnam: Hanoi and Ho Chi Minh City, giving you the flexibility in choosing where to build your system in order to maximize your system’s performance, availability, and redundancy. Deploy services in multiple regions: now you can choose rather you need a cloud in Hanoi or Ho Chi Minh City, or both. 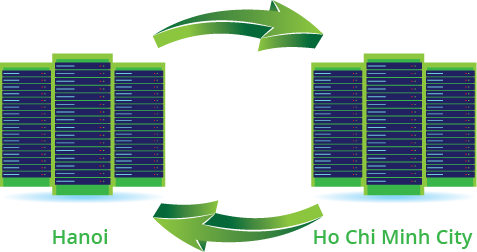 FPT HI GIO CLOUD offers you separation between datacenters located in Hanoi and in Ho Chi Minh City. Physical datacenter separation reduces the likelihood of natural disasters, civil unrest, power outages, or physical network outages affecting both regions at once. Data backup is a crucial part of your system safety. If the stateless components of a system fail, they can always be redeployed. But if the whole data is lost, the system can't return to a stable state. Your system and data must be backed up, in case of a disaster. 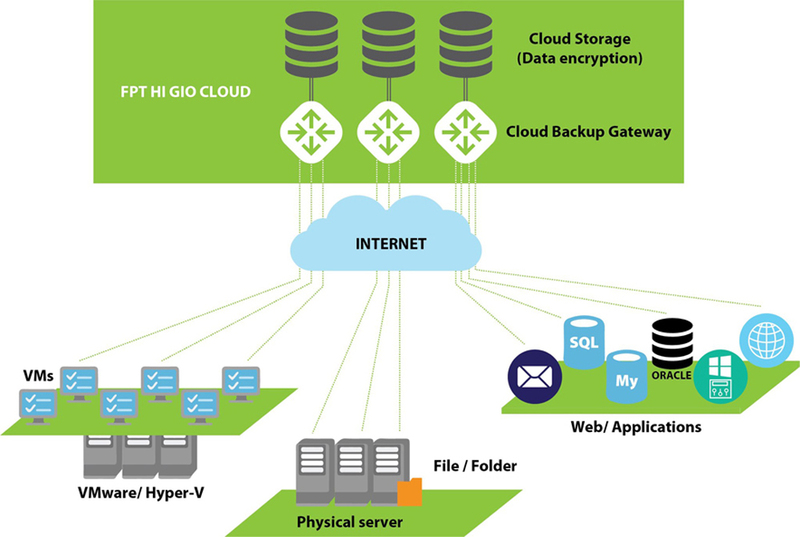 FPT HI GIO CLOUD provides you with the multiregional backup solution to stay protected against natural disasters or a human error or a bad intent – include long-term multiregional Backup as a Service in your DR strategy. In FPT HI GIO CLOUD, the Service Level Agreement (SLA) describes FPT Telecom commitments for uptime and connectivity. The FPT HI GIO CLOUD SLA is 99.99%, that means you should expect the service to be available 99.99% of the time. 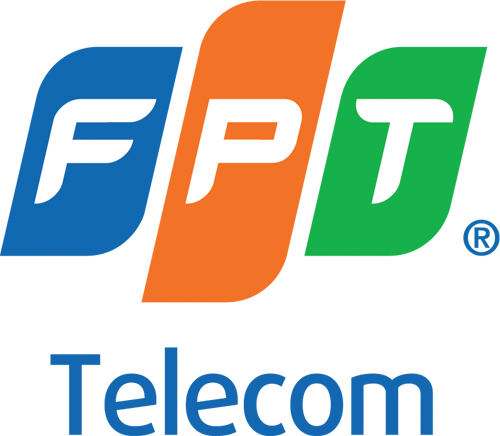 FPT HI GIO CLOUD Multiregional BaaS guarantees you robust protection and fast recovery. Monitoring is the act of collecting and analyzing data to determine the performance, health and availability of resources that you depend on. 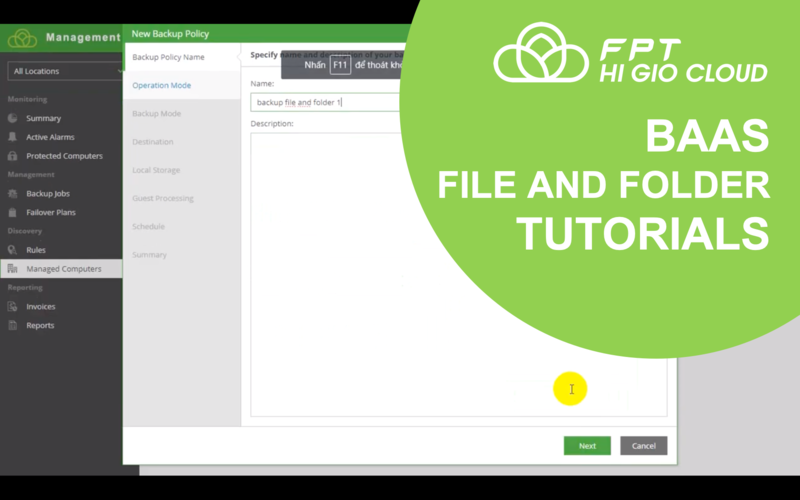 With FPT HI GIO CLOUD built-in Monitoring tool you now can see the full picture of your system: track your performance, troubleshoot and detect outages. Monitor and see all metrics of your system on one single display on FPT HI GIO CLOUD Web Portal. Monitor your Virtual Machines and Performance. Supported metrics: CPU, RAM, Disk capacity, Disk I/O and Network bandwidth. Manage an amount of resources you actually use and accurately assess your system. Analyze your reports and build your own plan to scale up or scale down, according to your needs. Ensure that you always keep your high performance and cost-effectiveness. Technical support about monitoring function is available 24/7/365 for all FPT HI GIO CLOUD customers. HOW TO USE MONITORING FUNCTION: View the User Guide, Click here. Schedule is the decentralized automation solution, which allows users to Start and Stop their virtual machines during off-hours on user-defined schedules. With this solution you can cut your costs on the resources with low usage or no usage and prevent unexpected overspendings. Schedule your VMs to start and stop. Set a timer to automatically switch on and off your virtual server. Make your administration simple and efficient: schedule your timer just in few clicks and the system will record and comply with your requirements. FPT HI GIO CLOUD calculates actual costs every second. For Pay-As-You-Go model users: your virtual servers will automatically switch off when you are not using them to minimize your costs. HOW TO USE SCHEDULE FUNCTION: View the User Guide, Click here. How to sign up for FPT HI GIO CLOUD? View the User Guide, Click here. How to create new VM? How to change specification of VM? How to reset password of VM? How to take snapshot of VM? How to take snapshot of Volume? How to add new Volume? How to setup VPN Client to Site? How to create a VPC Network? How to create NON-VPC Network? How to create firewall rule to allow access from Internet? How to upload ISO file? How to upload OVA file? How to install Windows from ISO file? How to setup a VPN Site to Site?